I started writing this post about a week ago. Then it got put on hold as life, or rather death, got in the way. Normally I wouldn’t write about very personal things on this blog; it’s a food blog after all, and people come here for food. But it just felt wrong to publish a new post without marking or acknowledging in some way the passing of my mother-in-law Judith who taught me so much about food. Judith died last Wednesday and will leave a huge hole in our family in so many ways. She’s the one who taught me the trick to Aga rice, and showed me how easy it is to make soup – I recall the revelatory feeling when during one of our family holidays in France she took one look at what I thought was a sad collection of leftover vegetables and transformed them, with the ease which comes from family cooking for many years, into a truly delicious soup. So this is what proper cooking is really about, I remember thinking. After my first Sunday lunch at Judith’s house, meat and two veg were never the same again. It is from eating well at Judith’s table that my own values around food developed – the importance of eating as a family, buying the best ingredients you can afford and eating seasonal and locally produced or reared produce whenever you can. The last time I saw Judith in hospital I told her about having just seen Claudia Roden at the Bath Literature Festival. I was as excited as a school girl. Of course, it turned out that Judith and her husband Tom are actually old friends of hers. I wasn’t surprised. There is so much more to tell you about Judith. Her family, her career, her art, her love of the countryside and of walking. But this isn’t the right place for a eulogy, people come here to hear about food. So here is the post I started last week. There’s been a fair bit of illness in our house in recent months. The girls still have stubborn coughs they can’t shake off. It’s easy to tell when my daughters are genuinely unwell, as they normally have such insatiable appetites, my oldest daughter Jessie in particular. When they say they’re not hungry, you know something’s wrong. This chicken soup with rice though was one of the few things that did go down well with both girls. My aunt shared some of her tips with me for feeding poorly babies over on Facebook and her suggestion of adding soy sauce and fish sauce to a simple chicken broth provided just the savoury combination of flavours to appeal to wonky tastebuds. It might also have helped that Jessie has been on at me for ages to make chicken soup with rice. One of our favourite albums to play on car journeys is Really Rosie, Carole King’s brilliant soundtrack from 1975 for an animated short film based on stories by Maurice Sendak, including the fantastic The Sign on Rosie’s Door. There are so many great tracks on this album from the alphabet song Alligators All Around and the counting tune One Was Johnny to the deliciously comical cautionary tale of Pierre, a little boy who finally learns to care when he is eaten by a lion. 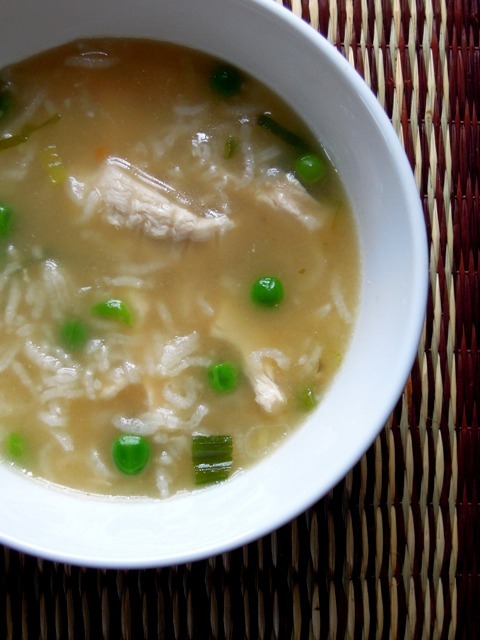 Not surprisingly, with our family fascination with food, Chicken Soup with Rice, a song to teach the months of the year, is the one we all love most. Ideal for using up Sunday lunch leftovers, this simple soup can be made in a matter of minutes from cold roast chicken and homemade stock. And if you don’t have homemade stock, use a really good quality chicken stock cube. Heat the oil in a large saucepan and gently fry the spring onions for a couple of minutes to soften. Stir in the rice and cover with the chicken stock. Add the soy sauce, fish sauce and shredded chicken and bring to a gentle simmer. Cook for 10 minutes until the rice is soft. Add the frozen peas, bring back to a simmer and cook for a couple more minutes. Serve with love. This is such a quick and easy dish to prepare, I’m entering it into this month’s Family Foodies challenge which I host with Louisa at Eat Your Veg. The theme this month is Fab Fast Food. I’m so sorry to read of your bereavement, Vanesther, your mother in law sounds like quite the cook – completing meals with competent ease, yet always giving accessible tips. Someone that we can truly all aspire to be like in our food blogging. Thank you for sharing her story, and a suitably soothing soup. Thanks so much for your lovely words, Mel. So sorry to hear of your loss – but what a lovely legacy she has left you. Sincere sympathy to you and your family. Thanks Linda – yes, she has indeed left an incredible legacy. She will be remembered by so many for her recipes and cooking. It looks like a delicious soup – just right for when you’re feeling a little ill. I’m so sorry for your loss as well. Thank you Corina – you’re very kind. I’m so sorry to hear your loss, she sounds like an inspiration. What a legacy she has left! A beautifully simple and delicious looking soup that I’ll definitely be trying. And what a sad loss, Judith sounds an inspiring lady. Your mother-in-law sounds a wonderful lady and I’ve loved reading this deeply personal post about her and her cooking inspirations, so beautifully written. It must be a very sad time for you all, my thoughts are truly with you. Such a soothing and somehow very appropriate soup. And another glorious speedy entry to Fab Fast Food of course. 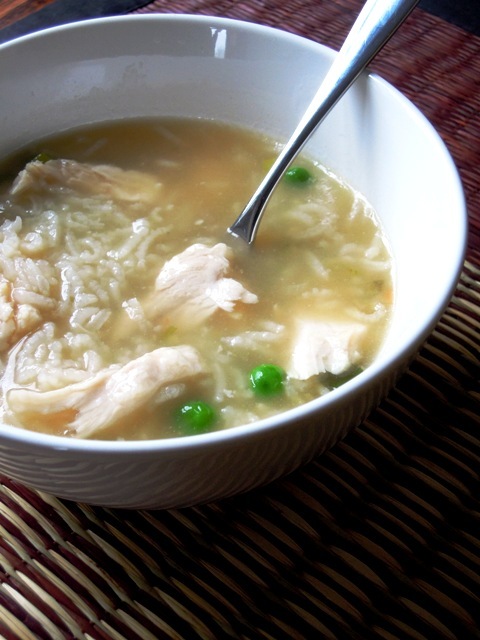 I love this type of chicken and rice soup, it’s what my mum made with the carcass of the roast chicken too. So sorry to hear about your loss Vanesther, she sounds lovely and your post is written so beautifully it just makes me miss my ma in law a lot , she is also a really good cook and what I love about her is that she never imposes her methods on me, I so wish we could spend more time together! I am sooooo sorry for your loss V. Big hugs to you all. So sorry to hear of your loss. How lucky you are to have had such a warm and nurturing mother in law in your life and all the more painful to lose. The relationship between a woman and her mother in law is often so fraught, so to have had a bond through food is wonderful. She sounds like a special woman. Best wishes for the healing and may you remember her in the years to come through the magic power of food. I am so sorry for your sad loss but the important thing is that your mil has left you with a wealth of happy memories and cooking knowledge that will stay with you foreever and I am sure you will pass on to your daughters. So in a happy sense she will always be with you. Soup is perfect for when we are feeling poorly or need a lite bite. Sorry to hear your family have been though this lately. To coin the phrase, chicken soup is definitely good for the soul. Sorry to hear about your mother in law’s passing. 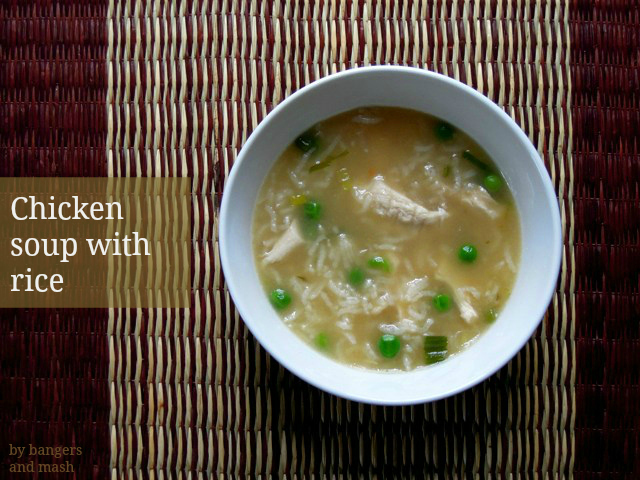 The soup looks nice though, and nothing is as comforting as a big bowl of chicken soup. Chicken soup is the most comforting dish.